MuCEM in Marseille: a Model in Public Development? While another French museum, the musée des Confluences, attracts all the public attention by its recent and very expensive opening, making it “France most expensive museum” (link in French [NDLR]) the MuCEM in Marseille continues quietly its success story. 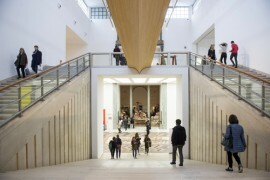 After a grand opening in 2013, during the festivities of Marseille-Provence 2013 European Capital of Culture, this museum still meets a great attendance, supported by an ambitious public policy. In order to better understand how the MuCEM is building its success in a city that, despite its geography at the crossroads of civilizations, has never had a real museum-loving tradition, we have interviewed Cécile Dumoulin, Head of the Public Department. What was your background before joining the MuCEM? I have followed quite traditional university courses and got a degree in art history, followed by a litterature degree. My first contact with museums has been while at the Louvre, where I have been in charge for four years of the Museums’s relationships with the ministry of Education. I have enjoyed this first experience, and few years later I have joined the Quai Branly before its opening, to develop and implement its public strategy. I have stayed there for 7 years. It is quite logical that I have joined the MuCEM in 2011, once again before its opening, to manage its Public Development Department, which has been my position for the last 5 years. MuCEM was nominated “Museum of 2015” by the Council of Europe, and its attendance, two years after its opening, is still very good. How do you explain this success? As a start, the MuCEM’s location is very attractive: this crossroads between Marseille historic district and the future Euro-Mediterranean area is a strong symbol, like a bridge between the traditional Marseille culture and a more modern side. Also it is localized on the former harbor of Joliette, which materializes the link between the Mediterranean sea and Europe. This strong attractiveness of its geography leads that only 2/3 of our visitors do visit the area, without visiting the exhibitions in the museum, which brought us criticism. But, given the attendance figures, this is not a situation for us: in 2014, on 2 million people visiting the area (in the museum and around it [NDLR]), 650,000 came to our exhibitions, which is far above our initial projections of 350,000 visitors per year. We are really pleased by the record attendance, especially because in the recent years, unlike in the 1980s, Marseille wasn’t really renowned for its culture. Now MuCEM has come to fill a void, becoming an emblematic place of culture in the city. 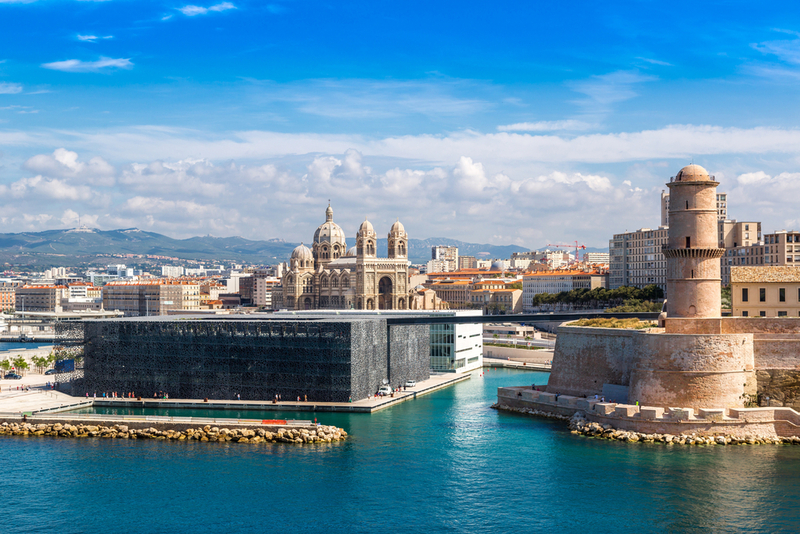 While media always speak of the city for the wrong reasons, the status of European Capital of Culture and the opening of MuCEM has brought a new sense of pride in Marseille. Upon taking office, Jean-François Chougnet said MuCEM should not become a museum dedicated to tourists, and that the focus would primarily be on local public. Is that still the case, or does the international public remain a target of the Museum? This statement has corresponded to a risk we have identified, due to the status of European Capital of Culture: we have been afraid to be seen as a purely tourist Museum, which could have scared away local visitors. In response, our goal has been as to achieve a balance between both local and tourist audience. To achieve this goal, we have put forward cultural recognition elements, such as Fort St. John, previously closed to the public. We have organized open days before the opening, and “MuCEM Tuesday” lectures by major European intellectuals. We have also used the “MuCEM Photo Studio”, an itinerant photo studio that has offered people to be photographed with an object linked to the Mediterranean. We have collected a thousand portraits, that we have distributed to the public and posted on Flickr. It seems that we have met our goals: now 49% of visitors are local, and 51% are from elsewhere, in France or abroad. We are currently trying to maintain this momentum, especially with the “museum pass”: an annual pass that provides access to all the museums in Marseille. It goes without saying that loyalty is also part of our exhibitions, we try to make as rich as possible. One of the particularities of Marseille is its social mix, do you have a strategy regarding the public from popular neighborhoods? Yes, it is indeed a plan we conduct under the term “social field”. What is complicated vis-à-vis this public is that offering them free entrance is not enough: we have to set up a qualitative, tailored and long term strategy, as they are far from having established museum practices. 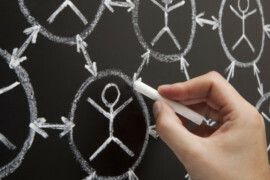 So we have developed actions in partnership with community centers and different types of other structures. Each year we try to define an operation to target these particular audiences. For example, last year we have conducted a big operation called “Mixfood” in connection with our “Food” exhibition, an exhibition of contemporary art. The operation has begun before exposure, in April 2014, targeting four neighborhoods in particular. We have worked with an association, by bringing in its members to make them discover the Museum, reserves, and discuss with the curators on the food topic. We have shown them the exhibited artefacts, and they have also been asked to collect missing items and recipes. It has helped us to show them both curating and creative work. Then we have conducted a series of “feasts”, in order to set up animations around the harvested items and recipes. The recipes have also been posted on Tumblr to serve as a primer in order to work with the rest of the public, encouraging everyone to contribute with a recipe. This work has continued during the exhibition, since the collected objects have been exposed. All the participants (around 1,000) have been nominated as ambassadors, allowing them to come to the “Food” exhibition at any time with the person of their choice. This year the chosen exhibition will be called “I love panoramas” on landscapes photos. This choice is due to the fact that even if the public living in the neighborhoods lacks many things, they have an abundance of what many do not: amazing point of views. You have just mentioned a number of strategies using digital media: what is their place in your audience development strategy? We work a lot with the new media service, targeting specific audience categories on projects, before their opening to the public, like we did on the exhibition “Food”. Besides when we ask our public how they discovered the Museum, social networks and the institutional website are among the lowest. This shows that these are only discovered after the visit, and function more like amplifiers and image modifiers. Some of your exhibitions sometimes approache politically sensitive issues likely to generate strong reactions. In particular the exhibitions about gender, or religion. 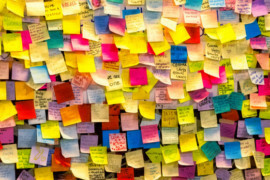 Is this is something that you take into account in your public development strategy? 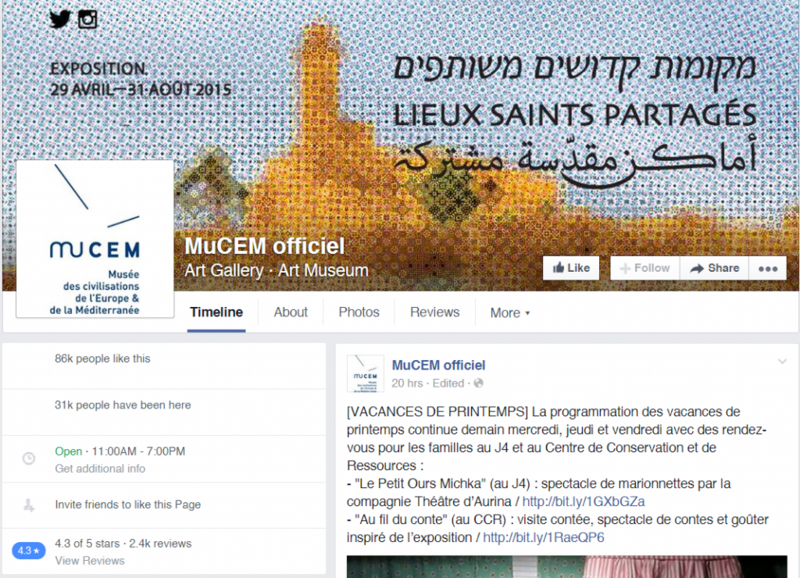 We notice that our public expects that MuCEM tackles this debates and think that we are legitimate for that. This is not a place of certainty but questioning, although it should be noted that the Museum’s position on these issues is that of the France: it is republican, secular and not militant. We rarely see overflows, even during the exhibition on gender, “Bazaar of the gender,” which has yet occurred during the debates on gay marriage. Surprisingly, we mostly have had reactions to an object depicting a woman torera in high heels holding a cauldron, symbolizing the mixture between the stereotypes of men and women. And critics have not come from anti-gender, but anti-bullfighting! Maybe there’s just more open-minded people visiting this kind of museums, because the others avoid being disturbed in their convictions. It is for these reasons that we have no problem addressing such issues, for example in our upcoming exhibition, “Shared Sacred Places”, which talks about places of worship shared among several monotheistic religions.